“Eight hours on the road can wear a girl out!” . . . .
Tru Tahlequah Miss arrives at last! Conceived in June of 2011 near Penrose, Colorado, “Tilly” was born on Mother’s Day 2012. It has been a long wait, but at six months of age, she was finally old enough to wean from her dam and come to live in Wyoming. She took the long drive in stride and seemed calm and curious about her new surroundings. 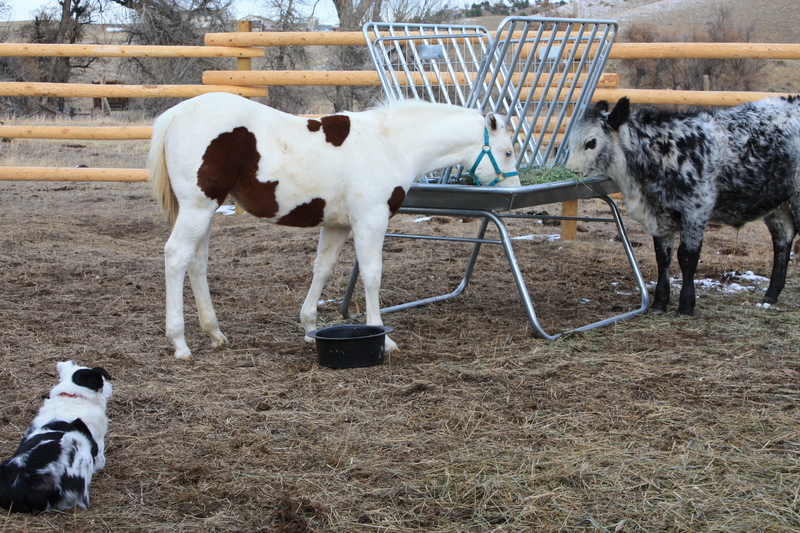 “What kind of bunk mate is this?” . . . .
Two weanlings get to know each other in a tenuous “sniff out” as they try to sort out what kind of critter stands before them. Abe the longhorn steer (a.k.a. Feed Lot; T-Bone; Rib-Eye and a few others I cannot recall) has been around a horse or two, but Tilly has had no prior exposure to beef on the hoof. Since they are close in age and both going through the weaning process, it seemed they might enjoy some company as they pass the lonesome hours without “Mom.” We’ll see. “Enough with the introductions, let’s eat!” . . . .
Rosie is sizing up the new arrival and more than likely wondering what approach she will take to “herd” this new creature, who seems to be getting a lot of attention from her mistress. Standard m.o. for a border collie/Aussie mix is to nip at the heels of a horse, which could have disastrous results. This should be interesting! 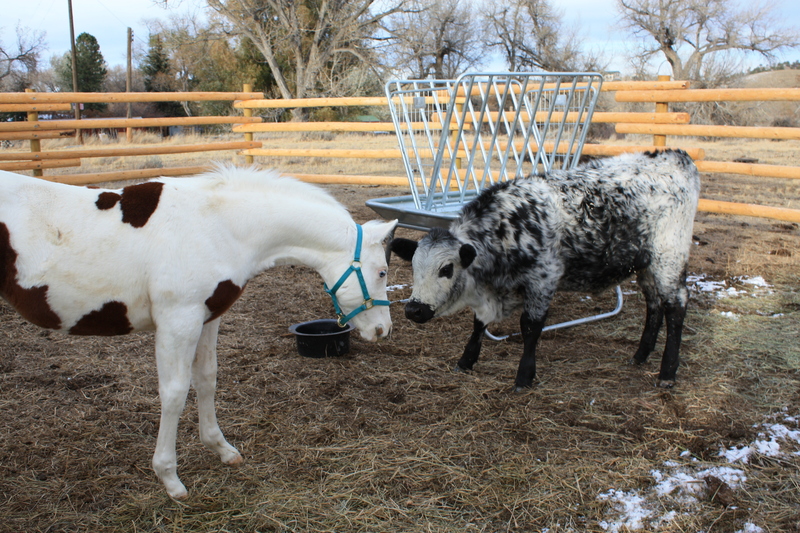 This entry was posted in Wildlife blog and tagged longhorn lunches with paint filly, paint filly by bygeorge. Bookmark the permalink. Can’t wait to meet the new addition.